Braking: Remote Control rheostatic, magnetic track brakes, air / hand brakes. Following the 2nd World War, Walter Luff decided on a change of policy on the operation of the tramway. He decided that the way forward was to dispense with the double deckers (the balloons and standards) and use as many single deckers as possible on a increased headway, as he felt that double deckers were too slow in loading and that people hated climbing stairs for short journeys. It would also mean that each tram would be crewed by 2 staff instead of the 3 staff required to crew a balloon. As a result he ordered 25 Coronation Trams to operate the main Starr Gate to Fleetwood Service. The Coronation Cars whilst being the most expensive and luxurious cars that Blackpool has ever had, almost finished the tramway off with rising repair costs, crippling loans to be repaid and problematic equipment which eventually had to be replaced with conventional equipment. The interior of the trams featured comfortable reversible seating, glass paneled roof, pneumatic operated centre doors and the latest VAMBAC control equipment that allowed for smooth acceleration and braking, rather than the jerky acceleration of the 8 speed settings on the other trams. The first car (304) arrived from Robert's (the same company who built Sheffield 513) on 5th June 1952 and it was even reported that its roof was leaking as it was being unloaded from the low loader. The tram was put into service and operated on the Starr Gate to Fleetwood route. 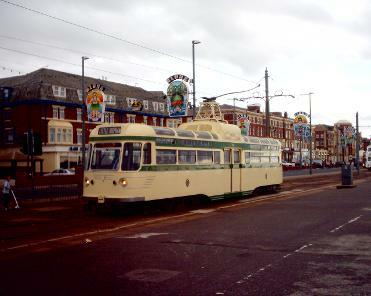 Soon afterwards, 304 made its public debut, when it was driven by the Mayor of Blackpool and comedian, Jimmy Edwards, from North Pier to Pleasure Beach. The public loved their new trams, however before long, newspapers were reporting that the Coronations would not be able to run on the Marton Route, car 305 was sent on a test run as far as Marton Depot at night. The test run was a success as the tram managed reach the depot and return to Talbot Square without any hitches. In hindsight it was probably wise that the tram did not travel any further along the route as it would probably have grounded on the railway Bridge on Waterloo Road. Thus it became the first and last coronation tram to operate on the Marton Route. Due to the greater width of the Coronations compared to the conventional trams, they could not operate on either the Lytham Road or North Station Routes as the double tracks on both routes were closer together than on the prom. Soon after the Coronations began to enter service, the problems started. 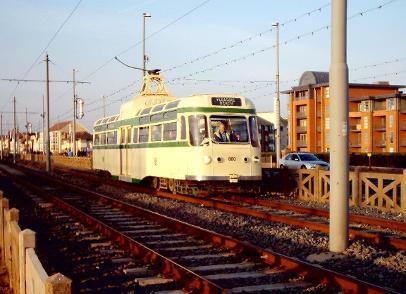 The trams suffered from fractured axles and also managed to trip section breakers in the Substations due to their high power consumption, leaving queues of immobile trams along the prom. Sand and dust was also causing a problem as it was getting into and causing the VAMBAC equipment, which was located below the trolley tower on the roof to fail. The Coronations also suffered from leaking roofs and windows. The Coronations had to get their axles replaced as the originals were found to be faulty and their acceleration performance also had to be reduced to stop them from blowing the Section Breakers. By 1965, they had lost their attractive chrome fittings and had their sides repaneled with their original steel panels being replaced with lighter aluminium panels to remove some of the body weight of the trams, which was 19 tons and heavier than the rest of the fleet. By 1963 313 had been withdrawn from service and was used as a source of spare parts. Its trucks were used as a float set and it's bosy was stored on trestles in Bispham depot until 1965 when works car 5 brought a pair of ex railcoach trucks to Bispham depot, the body was lowered on to them and 313 was towed to Blundell Street, where it was subsequently scrapped. 313 was also the last tram to leave Bispham depot and travel up Red Bank Road to Bispham. The remaining examples 24 Coronations were relegated to use only in the summer season, with Brush Cars and Railcoaches operating on the winter service. A number of Coronations had their VAMBAC equipment removed and replaced by Z4 and Z6 controllers from scrapped railcoaches. This improved the performance by quite a bit. From 1968, the remaining coronations were renumbered 641 - 664 and were gradually being withdrawn and scrapped, with the VAMBAC trams going first. By 1971, only 660 remained in Blackpool, preserved by Blackpool Corporation, with 641 and 663 going to museums. 660 saw sporadic use on the service and more use on specials and illuminations tours for a number of years. In 2002, 660 was joined by Coronation 641, which returned to Blackpool to be restored back to original condition as 304 with VAMBAC equipment. The tram featured on Channel 4's Salvage Squad program, with the car being relaunched into service in 2003. Both 304 and 660 have been retained as part of the heritage fleet, although both are out of service currently. They have also been joined by 663. It has returned to Blackpool and is currently stored in Rigby Road depot awaiting restoration.